What could be more exciting than starting a new painting for an artist?! Well, other than the completion of a painting, I suppose. 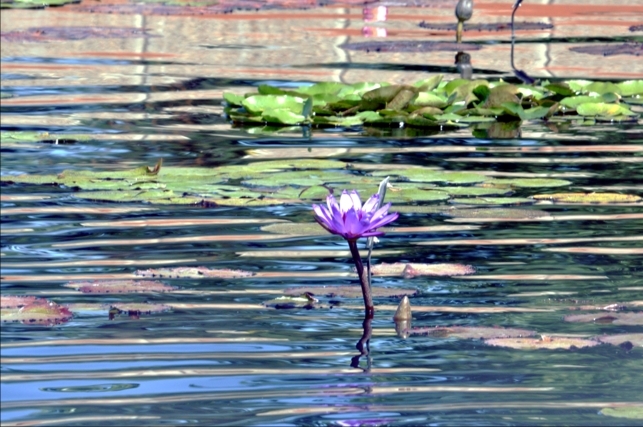 Now that my band painting is finished I am returning to the world of waterlilies for a while. However, all of the silver and reflections have inspired me to tackle a waterlily painting that will be very complicated indeed with all of the reflections in the water, as you can see from the photo on the left. 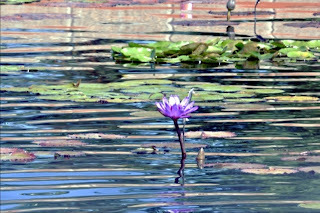 This photo was taken at the Denver Botanic Gardens and in my Corel Photo Paint program I have added 3 other waterlilies and moved everything to the right for a better composition. So, I have made this complicated scene even more complicated! I am also planning on trying to video this painting and possibly posting video excerpts. Well, I am off...waterlilies here I come! First off your finished silver piece is absolutely amazing!!!! And this waterlily painting is another masterpiece. You are so talented!! Lorraine, I am stunned by all of your art work I see so far! I have a LONG way to go before I am even a fraction as good as this! Wow! it looking so real.i appreciate your telent. reallly it is so beautiful painting.